Safavieh's Natura collection is inspired by timeless southwestern designs crafted with the softest wool available. 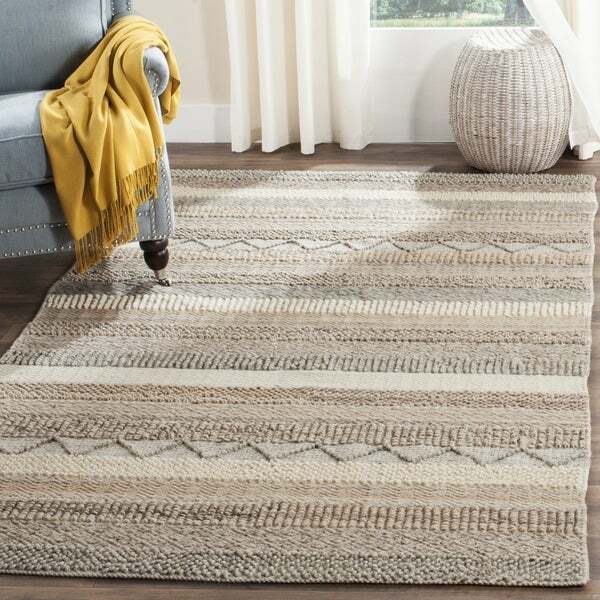 This rug is crafted using a hand-tufted construction with a wool pile and features main accent color of beige. The epitome of sophisticated beach house style, the Natura collection exudes an artisan-crafted look and texture. Soft, lustrous wool yarns are hand-tufted to create contrasting textures, including oversized loops and flat surfaces that are rich in dimension. An array of braided motifs, twills and boucle effects distinguishes this casual rug collection. This is a beautiful rug and should sell for much more elsewhere. I couldn’t be happier with the neutral colors and the warmth from a wool rug. A great buy and would highly recommend! The rugs are well made. The texture is great,working the colors through the rug. I love in our bedroom. LOVE LOVE LOVE! the bohemian print on this rug! this is the 3rd size i bought. It is much nicer and richer in person and the different textures really adds to the overall look! Neutral but makes a statement. This rug has a very chunky weave. So, it works well for stopping cat litter from tracking through the house. My kitties really like sleeping on it too.